Moonbow at Upper Yosemite Fall. A moonbow (also known as a lunar rainbow) is a rainbow produced by light reflected off the surface of the moon rather than from direct sunlight. 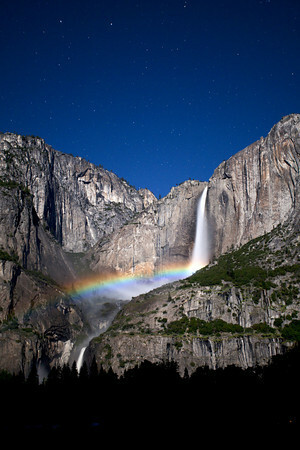 Many photographers ascend on Yosemite between April - July during a full moon to capture a moonbow either at the Upper Yosemite Fall, or at the Lower Yosemite Fall, Several factors are required to capture a Moonbow. © Copyright Jerry Gilligan 2011 All Rights Reserved.